Michael Showalter – founding member of The State and star of Wet Hot American Summer , The Baxter , and the brilliant-yet-misunderstood Marx Brothers homage Stella – will perform in Austin during both days of the Mess with Texas party and comedy festival (Friday and Saturday, March 16–March 17). Here, Showalter discusses The Michael Showalter Showalter and the state of comedy today. That Other Paper What inspired you to enter the arena of stand-up, and when did you get involved? 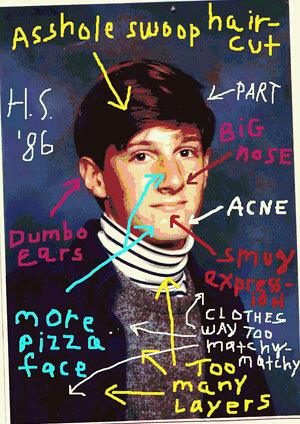 Michael Showalter I started doing little bits at clubs in New York a long time ago, but it was never really serious. It was more like, “I’m going to do the entire NY Times Sunday crossword puzzle in one minute” and then I’d struggle to answer one clue in the time. Then, after Stella was over and The Baxter had come and gone, I really wanted to take a break from production. I started doing stand-up, and it was fun. I liked the immediacy of it. Eugene Mirman, Leo Allen, and I went out on the road in May for two weeks. I realized that I had about an hour of material and I’ve been working pretty hard at it all year. My stand-up is still pretty alternative. I do lots of visual, PowerPoint-type stuff and use music. It works better in a music club than at a traditional comedy club. TOP Are alienation and outsiderdom essential components of being funny? MS I’m not sure. I definitely feel a lot of alienation and outsiderdom personally. I can’t say if there’s any direction relationship there. I do think that it might give you a different perspective on things if you’re always on the outside looking in. TOP Do bad comedians know they’re bad? MS No, of course not. Good comedians know when they’re bad. Bad comedians never know. TOP In your opinion, what are some indications of good and bad comedy? MS The best comedy is comedy that you have to go to and figure out. Ricky Gervais or Stephen Colbert – you need to get on their page. When something is trying to give you what they think you will find funny, it leaves me cold. Is it called “pandering”? TOP What do you think of the state of comedy today? MS I think it’s good. I like the direction it’s moving in. It seems like there’s more outlets for people whose sensibilities are left of center. TOP How was your Aspen Comedy Festival experience? TOP How did The Michael Showalter Showalter come to be? MS CollegeHumor.com asked me if I’d do some shorts for them. I wanted to think of something that would really easy to shoot. I’ve always liked the Larry Sanders format – the behind-the-scenes feel. I think that human foible is the funniest thing. My character on the show is broke and desperate to get ahead in the business. He’s interviewing all these cool comedians and then hitting them up for money when the cameras are off. I interviewed David Cross for an upcoming episode – I’m trying to get him to read a script I wrote, and he won’t read it even though I tell him that I wrote the part with him in mind. I like the idea of the pathetic hero. TOP How much of the show is scripted and how much is improvised? MS It’s all improvised but I know what I’m going for, which is to say I told Zach Galifianakis and Michael Ian Black that when the cameras were off I’d be asking them if I could borrow money. The rest is improv. TOP The feel of the show is reminiscent of Inside the Actors Studio or Charlie Rose. What do you think of those two shows? MS I think that Actors Studio is utterly absurd. Deep insights from Drew Barrymore on the art of acting – it’s totally lost the thread. Charlie Rose is a fantastic show. The interviews are intimate and comprehensive. In no uncertain terms I’m copying Charlie Rose. I only wish I was as smart as he is. My host is relatively incapable of conducting a good interview. I ask stupid questions like, “How do you think of an idea?” Maybe I’ll get better though. TOP With two professors as parents, was television something that was frowned upon in the Showalter household? MS Not at all. My parents are very culturally aware. I watched every episode of every sitcom that came out pre-1988. TOP What are your earliest memories of comedy, of seeing or hearing things that made you laugh? MS Animal House changed my life. Early Benny Hill. I loved Tom Hanks, Steve Martin, Michael Keaton, Robin Williams, Eddie Murphy, Woody Allen, Monty Python, Chevy Chase, Cheers, Three’s Company. TOP Are you able to pinpoint the first time that you were consciously aware that you were able to make people laugh? MS Relatively normal. I was kind of self-conscious. Wanted to be popular. A virgin until college. I was arty but not very focused. I got pretty bad grades. MS I was always good at ragging on people. I have a rapier-like wit. MS Not particularly. I liked college. I went to Brown and did lots of theater and improv. I was never a great student. Mostly just kind of lazy. I liked doing what I liked doing. I enjoyed certain classes and certain professors a lot. I took a film class at NYU my freshman year before I transferred to Brown and it really opened my eyes to a lot of things. It was mostly a genre class. I love film genres: Westerns, film noirs, that stuff. I liked deconstructing genres and watching movies from that perspective. It really influenced a lot of stuff I’ve done since. Most of the major projects I’ve done are genre deconstruction: Stella, Wet Hot American Summer, and The Baxter. TOP What are some other projects that you’re currently involved in or contemplating? MS Michael Ian Black and I are co-creating a new show for Comedy Central called Michael Ian Black Doesn’t Understand. I’m making a comedy record this summer. Going back out on tour. I’d like to write another movie soon. I have an idea but I’m avoiding writing it because I know that I’ll get consumed by it once I start. TOP What do you like to do after a performance? Michael Showalter on Tom Green Live!